Food has been recognised as a catalyst for bridging cultural differences. How do you differentiate one particular cuisine from another? Well, I was stoked to know that my favourite fast-food restaurant has finally come up with something absolutely different. Read on to find out more on how to win KFC vouchers! the Umadare OR Yang Yeum flavour! Anyway, my favourite KFC place is in NTU because the ambience allows natural light to fall in and the white-washed walls make it extremely spacious and beautiful. Freshly breaded in-store with a special batter, these juicy wings are cooked to crispy perfection and coated in two bold flavours! Here's a video to help you better understand the Umadare sauce (a tangy and savoury Japanese sauce) and the Yang Yeum sauce (a Korean-inspired sweet and spicy sauce)! The new fried chicken comes in 4 pieces for the a la carte: 2 wingettes and 2 drumette. You can also have them in a Rice Bento set (S$6.90), which comes with fragrant chicken rice, a side salad and a regular 7-Up Lemon Mint. Promotion is not available at KFC Sentosa, Singapore Zoo and KFC delivery. Umadare has a tangy yet savoury flavour albeit quite sticky. True enough, the japanese cuisine usually has tangy and savoury flavours (e.g. Japanese curry). The fried chicken was pretty sweet and the sesame seeds on the drummette added an extra fragrance to it. My favourite part is the Wingette though! I chose the Umadare flavour because the Yang Yuem is pretty spicy and the thick dark sauce looks like blood clot (sorry for the gross reference, I'm enrolled in Forensic science this semester). My mum, on the other hand, prefers the Yang Yuem because she loves spicy! You should try both and see what your preference is. 1. Upload your photos or videos with your favourite wings flavour on Instagram! 2. 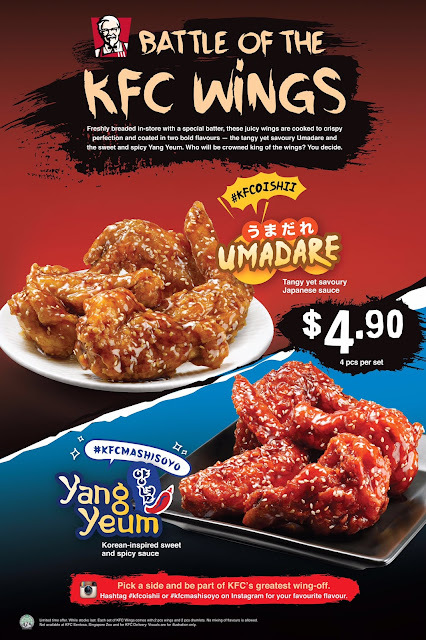 Tag @kfc_sg and hashtag ‪#‎kfcoishii‬ to vote for Umadare flavour or ‪#‎kfcmashisoyo‬ to vote for Yang Yeum flavour!